The National Council of Churches in the Philippines (NCCP) affirms God’s love for every person living with or affected by HIV. This year, we are encouraged by indicators that show HIV and AIDS related prevention, treatment, care and support expand significantly with 18.2 million people worldwide accessing antiretroviral therapy. Sadly, the situation in the Philippines remains dire. Our target to have 90% of all people living with HIV knowing their status is far from being met. But, the NCCP made significant contributions in encouraging the general population to get tested through the poster campaign. In the process partnerships were established with organizations involved in Community Bases Screening (CBS). Good information about HIV and accessible CBS encouraged significant numbers of people getting tested. Our churches have also led by example: a significant number of NCCP’s Executive Committee have publicly been through the HIV testing process; 250 bishops, priests and deacons of the Iglesia Filipina Independiente along with more than a hundred of their ordinands; and, 160 clergy and laity in the United Methodist Church. The “teach and test” model the NCCP applied in urban poor settlements have also resulted to hundreds of respondents. We urge the Department of Health to streamline the process of people knowing their HIV status. The rapid test kits used by the CBS are extremely accurate, allowing the person to know their HIV status within 10-15 minutes. This is translated into a percentage drop in people not going to get their results. Furthermore, rapid test kits are a cost effective way of proceeding with mass testing campaign and should be adopted as a primary method of HIV testing in the Philippines. While HIV disproportionately affects people who are pushed from the mainstream of our society, it is the HUMAN immunodeficiency virus that affects all human beings. Targeting certain sectors only continues to feed the stigma that these populations are responsible for HIV. We strongly advocate provision for special care for people who experience higher risk factor because of stigma and societal exclusion, while emphasizing that ending AIDS means expanding knowledge and testing campaigns to the general population. The NCCP supports the advocacy of the World Health Organization in conjunction with UNAIDS of the “test and treat” model as the most effective way to end AIDS by 2030. The program needs to be expanded. For this to happen, the government must dedicate at least 5% of our national budget to healthcare. This will not only address the underfunding of current healthcare but also expand the HIV program to put our country on course along with UNAIDS targets. God’s all-encompassing love reaches through time and space, enfolding the whole of humanity and creation. The life, work and ministry of Jesus Christ teach us that God has a special care for the poor, the isolated, the disenfranchised and the marginalized. The NCCP will continue to reach out intentionally with God’s love to people and communities and highlight their plight. 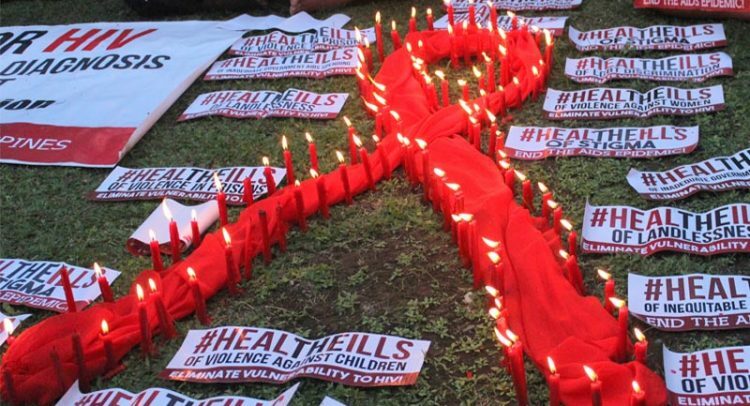 HIV highlights the fault lines of vulnerability, and challenges all of us to work together to put in place the funding, skills and programs needed to turn around the epidemic in the Philippines. May God lead us into the well of healing here and now. Rev. Rex R.B. Reyes, Jr.